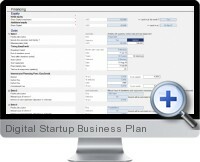 The Excel Digital Startup Business Plan template is a specifically designed Excel model for creating pro-forma financial statements and business plan for digital economy business models. The forecasting assumptions are tailored for recurring revenue stream such as SaaS, mobile apps and online businesses with subscription options. Digital startup businesses can quickly model scenarios and establish a robust financial business plan with advanced reporting to present to potential investors for funding requirements. Minimal experience in financial modelling is required for entrepreneurs requiring a comprehensive and compelling startup business plan. Automatic calculations allow the user to focus on business strategy as financials are created from robust formulas. Provides professional reporting with fully integrated profit and loss, balance sheet, and cash flow financial statements accompanied by KPI and value added analysis for efficient decision making. Flexible and expandable options allow the model to fit specific digital business models including regional accounting standards and tax regimes. Works with Excel for Mac, Windows and Office 365. Monthly revenue forecasts support multiple offerings of different structures including software as a service, membership subscription, application purchase, mobile in-app purchase and others. Assumptions geared for digital startup business types include subscription growth, retention rates, churn rates, upselling, customer acquisition, affiliate commission, revenue sharing and more. Key performance indicators on the business plan dashboard include monthly recurring revenue, customer acquisition cost/lifetime value, total contract value and more. The Excel digital startup business plan is designed specifically for digital economy business model structures with recurring revenue such as recurring revenue business models such as subscription based services, Software as a Service (SaaS) and mobile apps. For classic business structures see the alternative solutions listed below.